Linux Beach: With Flynn out, will @DrJillStein explain her Putin ties? With Flynn out, will @DrJillStein explain her Putin ties? Pictures like this have been in the news a lot lately. The scene is a dinner Party in Moscow in October 2015. 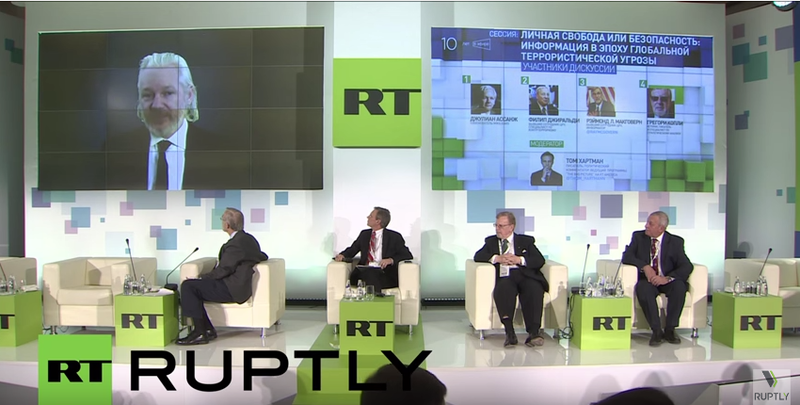 The occasion is the 10th Anniversary celebration for Russia's main international propaganda outlet, RT.com. General Michael Flynn was there. He has just been forced to resign as Trump's National Security Advisor because of the growing scandal over his, and Trump's, connections to Russian President Vladimir Putin. Even before this, Flynn had to admit that he was "compensated" by Russia for his trip to Moscow and appearance at this dinner. These pictures have been in the news a lot lately because they show Flynn and Putin together, but there is another American at this table, and in those pictures, that the media hasn't taken much notice of. The silver-haired lady in the foreground with her back to the camera is Jill Stein, who would become the Green Party candidate for president of the United States. 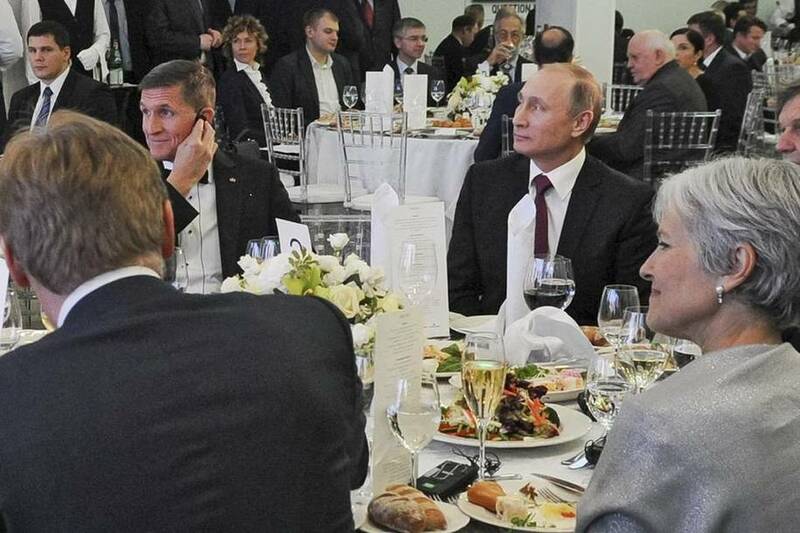 Both Mike Flynn and Jill Stein have long standing connections to the Putin propaganda outlet. Flynn had a regular show on RT.com, and they strongly promoted the Stein candidacy knowing it had no chance of winning. As Stein supporter Louis Proyect noted in his blog "it [RT.com] has published 105 articles in praise of Jill Stein." That was as of August, about the same time we published Meet Green Party's Jill Stein, Putin sock-puppet & Assad apologist, 10 August 2016. Google finds another 85 mentions of Jill Stein on RT.com after the 1st of August but before election day. From what has come out already, it is becoming increasingly clear that in 2016, Vladimir Putin pursued a policy of intervention in US politics with an aim of putting Donald Trump in the White House. Jill Stein played an indispensable role in its execution. So did the WikiLeak DNC email dumps. It's no accident that they came too late to help Bernie Sanders, but just in time to help Trump. Julian Assange had a virtual seat at this table. He made a video appearance at the dinner. Putin is the devious type who likes to play both ends against the middle. His main play was to put a friendly white nationalist, right-wing authoritarian regime in the White House, but to do this, he also needed the US Left to stand down from the fight against Trump until after the election. Jill Stein was central to his plans for getting that to happen. That is why she had a seat at this table. Her campaign was against Hillary Clinton, not Donald Trump, as her "Jill not Hill" campaign slogan made crystal clear. It was a campaign designed to get US progressives to sit out this election by either voting for her or staying at home. In the face of the tremendous evil we were facing, and will now have to endure, she counseled "Don't Vote for the Lesser of Two Evils." In the end, less than a hundred thousand votes in three states separated Donald Trump from Hillary Clinton, and just enough progressives followed Jill Stein's advice to put Donald Trump in the Oval Office. Jill Stein has never made it clear who paid for her trip to Moscow. She needs to come clean about that and, I suspect, much more.